(1) God reveals something to a person. (2) In the reception of the revelation there is the possibility of problems entering into the process. a. A faulty interpretation of the revelation may happen. b. There may be additions to the revelation that are added by the receiver. 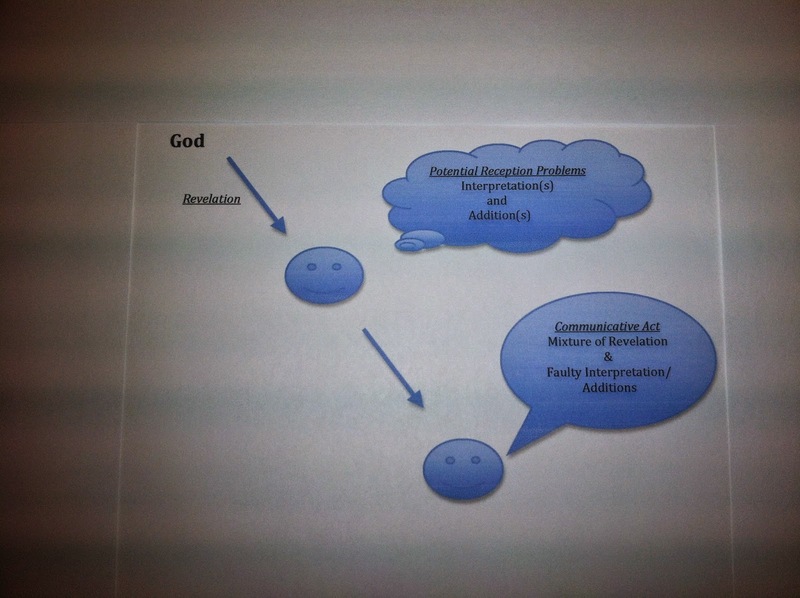 (3) In the communication moment what is communicated is a mixture of the revelation (given by God) and possible misinterpretations or additions generated by the receiver. The key is in recognizing that with every prophecy there are four elements, only one of which is assuredly of God: There is the revelation itself; there is the perception or reception of that revelation by the believer; there is the interpretation of what has been disclosed or the attempt to ascertain its meaning; and there is the application of that interpretation. God is alone responsible for the revelation. Whatever he discloses to the human mind is altogether free from error. It is as infallible as he is. It contains no falsehoods; it is wholly true in all its parts. Indeed, the revelation, which is the root of every genuine prophetic utterance, is as inerrant and infallible as the written Word of God itself (the Bible). In terms of the revelation alone, the New Testament prophetic gift does not differ from the Old Testament prophetic gift. Error enters in when the human recipient of a revelation misperceives, misinterprets and/or misapplies what God has disclosed. The fact that God has spoken perfectly does not mean that human beings have heard perfectly. They may interpret and apply, without error, what God has revealed. But the mere existence of a divine revelation does not in itself guarantee that the interpretation or application of God’s revealed truth will share in its perfection. In this passage Paul is nearing the end of his third missionary journey, and he is drawing near to Jerusalem. His ship lands at the port city of Tyre (in Syria, on the coast, somewhat northwest of Galilee). Paul and his companions had to wait there for several days while the ship unloaded its cargo, so they sought out the Christians there. And having sought out the disciples, we stayed there for seven days. Through the Spirit they told Paul not to go on to Jerusalem. And when our days there were ended, we departed and went on our journey (Acts 21:4-5, RSV). But if this really is a report of prophesying, as it certainly seems to be, then it is very significant for understanding the nature of prophetic authority in ordinary New Testament congregations. It is significant because Paul simply disobeyed their words, something he would not have done if he had thought that they were speaking the very words of God. On the other hand, if the disciples at Tyre had a gift of prophecy which was similar to what we found at Corinth and at Ephesus, and perhaps also at Antioch (see above), then Paul’s disobedience to the prophecy would be entirely understandable. In fact, we can surmise something of how such a prophecy would come about. Suppose that some of the Christians at Tyre had had some kind of ‘revelation’ or indication from God about the sufferings which Paul would face at Jerusalem. Then it would have been very natural for them to couple their subsequent prophecy (their report of this revelation) with their own (erroneous) interpretation, and thus to warn Paul not to go. [T]he expression “through the Spirit” (in Greek, dia tou pneumatos) modifies the verb “they were telling” in the Greek text (it modifies the imperfect verb, elegon). That is why the verse is translated, “And through the Spirit they were telling Paul not to go on to Jerusalem” (italics added). So here is speech given “through the Spirit” that Paul disobeys! This fits well with a view of prophecy that includes revelation given by the Holy Spirit and an interpretation and report of that revelation that is given in merely human words, words that the Holy Spirit does not superintend or claim as his own, words that can have a mixture of truth and error in them. This is why the prophecies have to be tested, and this is why Paul feels free to disobey in this case. Again, Luke’s point is not the impaired validity and unreliability of their speech, in which nevertheless the Spirit is somehow instrumental, but their recoil against what the Spirit had revealed to them of Paul’s future. That revelation and their response to it must not be confused or merged in their speech-act. Here Dr Gaffin seems to understand the event in a way similar to what I expressed above. There is a revelation from the Holy Spirit to the disciples at Tyre, and in response to that revelation, they tell Paul not to go to Jerusalem. The difference in our viewpoints is that I would call the response or report of that revelation a ‘prophecy’, and Dr Gaffin would not. But whatever term is used, it is significant that we would both say that there can be a ‘revelation’ from the Holy Spirit to a person or persons, and also a spoken response to that revelation which can have ‘impaired validity’ and ‘unreliability’. That is really the essence of what I am arguing for in this book, and what—it seems to me—the New Testament usually calls ‘prophecy’. But if the concept be admitted even if it is called not ‘prophecy’ but ‘an unreliable human speech-act in response to a revelation from the Holy Spirit’, there does not seem to be much difference in our understanding at this point. Nor does there seem to be strong reason for saying such an ‘unreliable human response to revelation from the Holy Spirit’ could not happen today. The strongest case for a different kind of prophecy in the new covenant community may be derived from the prophecies related to Paul’s going up to Jerusalem. In its baldest form, Acts 21:4 indicates that ‘through the Spirit’ the disciples at Tyre urged Paul not to go on to Jerusalem. Yet earlier Paul reported to the saints in Ephesus that he was ‘compelled by the Spirit’ to go to Jerusalem (Acts 20:22). On the surface of things, it appears that the report of an apostle regarding the work of the Spirit is flatly contradicted by the urging through Spirit that comes through the disciples. This way of putting things captures the issue quite well. Is it to be concluded that the true nature of new covenant prophecy now has become clear? Is it that through one and the same Holy Spirit messages are to be delivered to God’s people for their direction that flatly contradict one another? Several noteworthy commentators of various theological persuasions have no problem resolving the apparent discrepancy. Neither Johannes Munck nor F. F. Bruce nor J. A. Alexander nor John Calvin suggests that the Spirit has contradicted himself, or that New Testament prophecy hereby is proven to be a mixture of good and bad, of truth and error. Each in his own way concludes that the Spirit revealed to these disciples the sufferings Paul would undergo at Jerusalem. To this perfected revelation the concerned disciples appended their own conclusion: that Paul should not proceed to Jerusalem. It was not that the Spirit or prophecy erred at this point. Instead, it was simply that the disciples’ concern for the well-being of their mentor limited their apprehension of the good that might come from Paul’s suffering. Dr. Robertson, by way of response, refers to four commentators on Acts who all concluded that the Holy Spirit had revealed to these disciples “the sufferings Paul would undergo at Jerusalem” and then to this matter that the Holy Spirit had revealed, “the concerned disciples appended their own conclusion: that Paul should not proceed to Jerusalem” (p. 111; he refers to commentaries by Munck, Bruce, Alexander, and Calvin). It is interesting that this is exactly what I think happened as well, though Dr. Robertson does not indicate this to the readers (see GiftNTT, 93-95=GiftNTT2000, 75-77). In addition, Dr. Robertson says that none of these commentators suggests, “that the Spirit has contradicted himself” (p. 111). The problem with this objection is that I do not suggest that the Spirit has contradicted himself either, but Dr. Robertson does not indicate that to his readers. More precisely, I think that the interpretation given by some of these prophets contradicted the true message of the Holy Spirit that Paul had earlier received, and that he was following as he went up to Jerusalem. The difficulty with the entire passage, and one which Dr. Robertson nowhere mentions or deals with, is the fact that the expression “through the Spirit” (in Greek, dia tou pneumatos) modifies the verb “they were telling” in the Greek text (it modifies the imperfect verb, elegon). That is why the verse is translated, “And through the Spirit they were telling Paul not to go on to Jerusalem” (italics added). So here is speech given “through the Spirit” that Paul disobeys! This fits well with a view of prophecy that includes revelation given by the Holy Spirit and an interpretation and report of that revelation that is given in merely human words, words that the Holy Spirit does not superintend or claim as his own, words that can have a mixture of truth and error in them. This is why the prophecies have to be tested, and this is why Paul feels free to disobey in this case. Although such as had the gift of prophecy did not, nor could not err, so far as they were inspired by the Holy Ghost, in prophesying, much less in writing Scripture, yet they might have, and some had, their own mistakes and errors in particular cases…Another instance in those prophesying disciples, Acts xxi.4, ‘Who said to Paul, through the Spirit, that he should not go to Jerusalem.’ Their foretelling and foreknowing of Paul’s danger at Jerusalem was from the Spirit of prophecy; but the consequence they did draw from hence, that therefore Paul should not go up to Jerusalem. This interpreters conceive was only from their own spirits, though they misfathered it upon the Spirit of God. There might be also something mingled with that which the prophets received, and it might fall out that that which they added of their own, by way of confirmation, illustration, or application, might be justly subject to censure, wherefore it must be tried and judged by others, whether the prophecies proceed from the inspiration of the Holy Spirit, and according to the rule of faith.’ Isa. viii.20. Although this discussion has focused only on one passage there is, nevertheless, an important congruence of thought among cessationists and continuationists as to their understandings of Acts 21.4. Both groups seem willing to affirm the same reality. The dividing issue seems to be what linguistic token to use when describing this reality. Continuationists have no problem calling this reality “prophecy” whereas cessationists are very hesitant to use this word to describe the issue. C. Samuel Storms, “The Third Wave View,” in Are Miraculous Gifts for Today? Four Views ed. Wayne Grudem, (Grand Rapids: Zondervan, 1996), 207-208. Wayne Grudem, The Gift of Prophecy in the New Testament and Today (Westchester: Crossway, 1988), 93-94. Wayne Grudem, “A Response to O. Palmer Robertson, The Final Word,” 22. Online: http://www.waynegrudem.com/wp-content/uploads/2012/04/Robertson-O-Palmer-response-by-WG.pdf. Richard Gaffin, Perspectives on Pentecost (Phillipsburg: Presbyterian and Reformed, 1979), 66. Wayne Grudem, The Gift of Prophecy in the New Testament and Today (Westchester: Crossway, 1988), 95. O. Palmer Robertson, The Final Word: A Biblical Response to the Case for Tongues and Prophecy Today (Edinburgh: Banner of Truth, 1993), 110-111. Wayne Grudem, “A Response to O. Palmer Robertson, The Final Word,” 21-22. Online: http://www.waynegrudem.com/wp-content/uploads/2012/04/Robertson-O-Palmer-response-by-WG.pdf. George Gillespie, A Treatise of Miscellany Questions (Edinburgh: Robert Ogle, and Oliver & Boyd, 1649), 35.